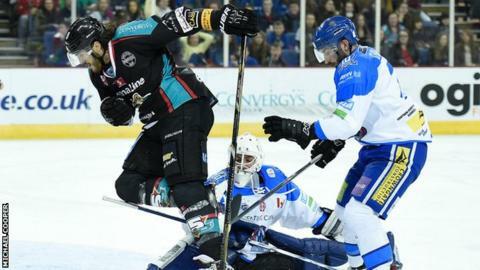 Belfast Giants's remaining slim hopes of retaining the Elite League title after surely over after they suffered a second defeat in 24 hours in Coventry. Once again, the Giants were on the wrong end of a 3-2 scoreline as Russ Cowley hit Coventry's winner with three seconds remaining at the SkyDome Arena. The Giants are now nine points behind leaders Braehead and have played a game more than the Scottish club. Colin Shields and Ray Sawada scored Belfast's goals in the first period. The two Belfast strikes put them ahead after Coventry's Jakut Sindel notched the first goal of the match before Derek Lee levelled for the hosts prior to the end of the opening period. After a goal-less second period, the match looked set for over-time before Cowley's pile-driver of a shot secured victory in the closing seconds. The defeat drops the Giants to fifth in the table and given that they only have nine league games to play, their chances of holding on to the title have almost certainly been extinguished. The Giants lost despite having Kevin Westgarth and Mike Kompon available again after their one-match suspensions. On Saturday, Sawada and Adam Keefe scored Belfast goals as Ben Arnt, James Jorgensen and Cale Tanaka were on target for Coventry.